However, when Joseph presents his sons to his father, Jacob acts as if he doesn’t know them after being around them for the last seventeen years. He asks Joseph, “Who are these?” (v. 8). Most people attribute Jacob’s question of their identity to his eyesight, because just two verses later the Torah tells us, “Now the eyes of Israel were dim with age, so that he could not see” (v. 10). However, there may be a deeper answer given to us by the Torah, and one that can help us see a beautiful picture of what Yeshua has done for us. Most English translations render Joseph’s response to say, “They are my sons, whom God has given me here” (v. 9). However, the original Hebrew is slightly different and contains unusual wording. It says, “They are my sons, whom God has given me with this” (bazeh). Rashi takes note of this unusual wording and asks what “this” is referring to. According to him, Joseph is showing his father his ketubah, his marriage contract. At first this seems a little absurd. Why would Joseph hold out his marriage contract in response to his father’s question about his children? But if we think about it, this is the answer to the question that Jacob asks. Jacob knew Ephraim and Mannasah, so his question is not one of recognition, but one of identity. If we remember, Joseph had married “Asenath, the daughter of Potiphera priest of On” (Genesis 41:45). Joseph’s marriage to an Egyptian, particularly the daughter of a pagan priest, would have undoubtedly been a concern for Jacob. Jacob most likely saw Ephraim and Manasseh as Gentiles and not as the heirs to Abraham’s blessing and covenant. 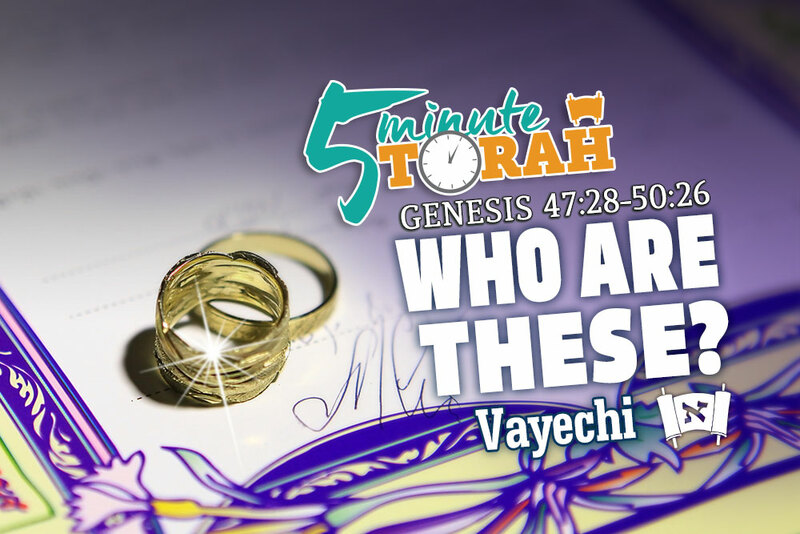 If Joseph was showing Jacob his ketubah, however, Joseph would be saying that his wife was no longer the daughter of a pagan priest, but had given up her pagan identity for a new one. This allowed Jacob to see the true identity of his grandsons and the confidence to adopt them as his own. Therefore, Ephraim and Manasseh are considered the offspring of Abraham and heirs to the promises of Abraham just as Joseph was. Once we come to Yeshua and have renounced our pagan identity we take on a new identity. Yeshua’s father looks at us not as pagans, but as one of His own. The Apostle Paul was given divine revelation in this regard and developed a theology that was radical for his day. He said that Gentiles who have accepted Yeshua are grafted into the “nourishing root of the olive tree” of Israel (Romans 11:17), that they are “fellow heirs, members of the same body, and partakers of the promise in Christ Jesus” (Ephesians 3:6), and “Abraham's offspring, heirs according to promise” (Galatians 3:39). If we are in Messiah we have a place at the table, so to speak. We don’t have to worry that our father won’t recognize us or claim us as His own. When Hashem asks Yeshua, “Who are these?” he will identify us as his sons and daughters, children of Abraham, and heirs to the promises.